The Single Father's Guide: How Murray Saved Christmas: Hilarious! 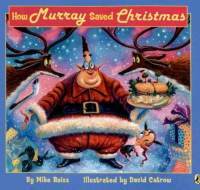 How Murray Saved Christmas: Hilarious! I cannot believe I've missed this one. Published in 2000 by Price Stern Sloan, illustrated by award-winning editorial cartoonist David Catrow, and written by Harvard Lampoon and "The Simpson's" writer Mike Reiss, How Murray Saved Christmas is hilarious. Written in the style of "Twas The Night Before Christmas," Murray is the proprietor of a Jewish diner. After a devilish little elf named Edison plays a practical joke that results in Jolly Ol' St. Nick getting knocked-out cold, it's up to Murray to save the holiday. Understandably, Murray is suspicious about the undertaking when Edison explains the predicament, "I can make you Whatever you wish. A nice piece of fish. Or a spinach knish." Bringing billions of presents to kids I don't know. Will anyone pay me? Will anyone tip? What if I slip and fracture my hip?" Eventually, Edison persuades Murray to stand-in for Santa Claus and Murray encounters humorously frustrating obstacles at his first few houses. Murray even has to try to assure a little boy at one of the houses that he, Murray, is in fact Santa by reciting the names of his reindeer, "There's Dumbo and Jumbo and Mason and Dixon, Cosmo and Kramer and Richard M. Nixon." The little boy remains skeptical. Eventually, Murray gets the hang of present thing and even "...brought toys to the Naughty (a Very long list!)" When he finishes, Murray achieves a sort of cautious mutual respect with Edison Elf as the story ends with a cute, slight modification of a traditional Christmas greeting. It's a very nice ending for a book which includes an equally nice social commentary. The kiddies will enjoy Mom or Dad reading this one aloud, as long as Mom and Dad's laughing-out-loud isn't too distracting.